Discussion in 'Google TV News' started by JimMariner, Oct 9, 2010. The power of Google search is now on your HDTV. With Google TV you can seamlessly search for content, no matter where it comes from. Search the Web for your favorite YouTube video. Find a classic TV rerun. Stream a box-office smash. Tune in to the big game and check your fantasy league standings at the same time. Even access a world of powerful apps. It's as easy as changing the channel. No switching devices, no changing inputs or interfaces. Just search, select, and watch on your HDTV  whenever and whatever you want. To use Google TV you don't have to buy a new HDTV  all you need is Logitech Revue. 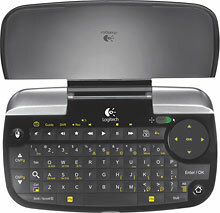 Logitech Revue with Google TV brings together endless entertainment choices into one simple-to-use interface. Connect the Logitech Revue companion box to your existing HDTV and it becomes a super-smart, Web-friendly TV. Get seamless access to the Web, your TV programming, compatible DVRs and pre-installed apps like Netflix (subscription required) and Pandora. Just pick up the keyboard controller and start searching. It's simple to set up and easy for the whole family to use. And you won't spend a dime on monthly fees. Your HDTV is the place to do it all. Search everywhere, watch anything and utilize powerful apps designed specifically for Google TV. Want to check stats or stocks, get news updates or shop for flights while watching TV? Switch with a click, or see both with the picture-in-picture feature. It's a wireless remote control, keyboard, and touch pad in one. And it works in harmony with your HDTV, cable/satellite box and compatible DVR, so you can put the other remotes away. Use it to turn on the TV, type, search, rewind and more. 1. Connect your cable or satellite box to Logitech Revue (instead of your HDTV). 2. Connect Logitech Revue to your HDTV with the HDMI cable provided. 3. Access your existing high-speed Internet wirelessly or with an Ethernet cable. As experts in keyboards, remotes and webcams, Logitech has everything you need to make the most of the Google TV experience. Want to make and receive high-definition video calls, right from your television? Connect a Logitech TV Cam and say hello in HD. Looking for the perfect small companion to your Logitech Revue or other Google TV system? Add a thumb-sized keyboard, touch pad and remote combo that looks cool and saves space on the coffee table. Cool mini-controller, but I hope the Android app 'controller' will suffice...I tend to already have my phone nearby anyway!